Car industry body the Society of Motor Manufacturers and Traders (SMMT) has said used car sales figures released last week were not correct. It blamed the mix up on an incorrect algorithm when it crunched official raw data. In figures released on 16 August, the SMMT said used car sales had fallen sharply - 13.5% in the second quarter of this year. But the revised figures now show the fall was actually a more gentle 0.7%. When the figures came out last week, it added to speculation that consumers were nervous about the UK economy and reining back spending. But a SMMT spokeswoman said on Thursday: "[Our] data team discovered there was an issue with an algorithm they used to process the data." The car industry body gets its raw used car sales data from the DVLA, the UK's vehicle licensing agency. The error occurred at some point in crunching those numbers, the spokeswoman said. 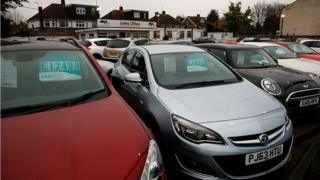 Rather than a fall from 2.12 million to 1.83 million secondhand car sales in the three months to end-June, the fall was more like 2.12 million to 2.11 million, the SMMT said. Mike Hawes, SMMT chief executive, said in a statement on the revised figures: "Although the market remains at an exceptionally high level, given the softening we've seen in registrations of new cars in more recent months, looking ahead it is vital that government secures the conditions that will maintain consumer and business confidence if we are to see both markets continue to prosper." Separately, figures from the industry body released on Thursday showed that car manufacturing in July rose 7.8% as manufacturers increased production with new models.